On a cold December run, my feet warm to the pavement; slowly they loosen, oblige. I am aware, for the first time, of my ankles – how they seem to hinge and unhinge, how they pivot me forward. From the ankles of Hermes sprouted wings, I’m reminded; speeding the messenger of the gods back from the underworld with news for the human one. 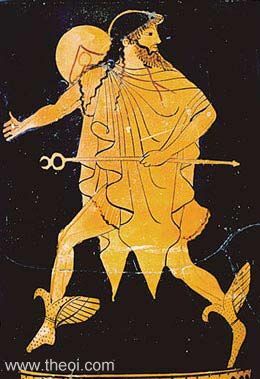 I don’t feel the uplift of Hermes’ wings this morning, but my feet do plod on, hinge, unhinge. Hermeneutics is the work of Hermes; it’s the interpretation of hidden meaning; it’s also the discipline my father taught for years at a seminary. Which means that he, too, loved the diving down into ancient texts in order to bring up fresh meaning. He washed words in the underground pools of their original making and made them shine. Today, even as I run, he is miles away on a surgical bed, his ankle opened, two broken bones being righted after a bad fall. He has always been a messenger from other realms, I think. And now, even now, even as his swift movements cease, he is diving and surfacing. He is going down to places I have not yet been, and he is rising up with those depths swimming in his eyes. Even now he is, like Hermes, a boundary crosser, a traveler, a guide to the mysteries beyond. And all of those among us who face their own finality and yet rise to praise the day, who fall and yet find grace in their falling, who dwell in the life-and-death, ball-and-socket hinge of every moment — all of these souls are messengers of mysteries we might heed, are they not? I can’t help but wonder today what the doctor is finding there where two broken bones meet in the swivel of the ankle. I am just imagining, just imagining, a little spur, there in all of us ready to bloom when our time comes to travel the deep. A little spur . . . where wings begin. ~ by Stephanie on 01/02/2010. It must be the week of angels — and not the treacly kind. I, too, have been musing on angels and had forgotten the wings of Hermes. Thank you, again, for a beautiful, thoughtful post. I so love this new blog and intend to feature it on my own!